"An unconfirmed source has revealed that Nintendo are currently working on a wireless version of their Nunchuck attachment for the Wii remote.This comes after many complaints from gamers who feel that the dangling wire which links the two devices, simply distracts from gameplay, especially in games which require significant movement of the arms, such as Wii Boxing or Call of Duty 3. 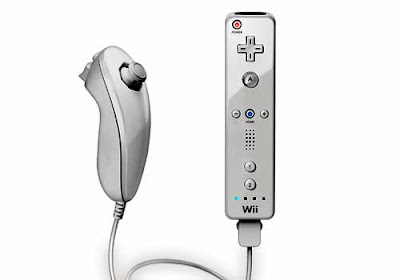 The Wii Nunchuck gets it's name from the martial arts weapon, the ''Nunchuckas'' because of the similarities in design; a chain/wire connects two heavier objects at either end. The wireless Nunchuck attachment will possibly undergo a name-change to make sense. There's no reason for Nintendo not to make future wireless devices for the Wiimote - a wireless receiver would plug into the remote in place of any wires linking the two. Communications between Wiimote and Console would be as normal. The downside to this is the added drain on batteries, though with Nintendo's track record with their previous wireless technologies, we're sure they will leap this hurdle. Nintendo were unable to comment at the time of press." A wireless Nunchuck would be great so you wouldn't worry about that cord in between the two controllers anymore. More freedom of movement is always a good thing. More as it develops. Yeah it's a great idea to have that, but there will be other concerns too such as battery life on the nunchuck. Plus as a gamer, I now have the ability to lose the nunchuck when it would be attached to the Wii Remote. But that's like 5% chance in my Wii-Life span that that's going to happen. You can buy a 15 minute Duracell battery charger that comes with 4 batteries for only $30 bucks. Its worth it. You can buy them at any Circuit City, Target, Best Buy or Wal Mart.